Yesterday a reader left a comment for me on the Daily Dish Facebook Page, saying she’d made one of the soups from my cookbook Kick the Can! and really loved it. WOW. Totally made my day! So in honor of this lovely reader, I thought I’d not only share the recipe she mentioned, but also offer a copy of the cookbook to someone else! Although the book is short (only 20 pages) it contains 16 of the tastiest salt-free soups imaginable, something for every season, moment and mood. From sweet to savory, simple broth to the chunkiest chowder. Beef, chicken, fish and vegetables. Tempeh and tofu. Did you know you can eat soup for breakfast? You can! and enjoy it too. And these soups aren’t just salt-free, the bulk of them are also low-fat or fat free! If you want to be WOWED by just how wonderful homemade soup can be, please do us both a favor and BUY WIN MY BOOK! To enter, simply leave a comment below letting me know you’d like to win, and on Monday I’ll announce the lucky random winner. Everyone is welcome; no residency restrictions apply. And to put you in the mood, here’s the recipe! A warming dish for a nippy day, this soup is filled with the earthy flavors of mushrooms and garlic. ENJOY! Heat oil in a stockpot over medium. Add the onion, celery, and garlic and saute 3 minutes. Add the mushrooms and cook, stirring, 7 minutes. Add the broth and seasonings, raise heat to high, and bring to a boil. Once boiling, reduce heat to low, add the orzo, and stir well. Cover the pot and simmer 20 minutes. 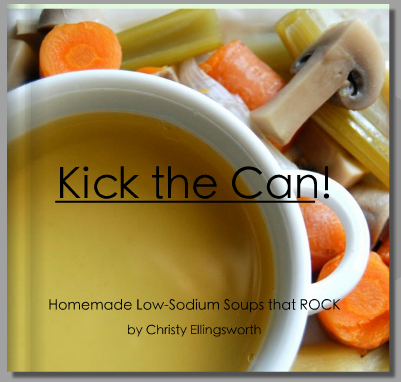 This entry was posted in Promotional Giveaway, Soup and tagged giveaways, Kick the Can!, low sodium cookbooks, low sodium soups, low-sodium recipes. Bookmark the permalink. I’d love to try some low sodium soup recipes. I’ve had to drastically cut my salt intake for health reasons and I miss soup the most. I would love the opportunity to win a copy of the cook book. It’s so tough to adjust to low-sodium eating when the rest of the world around me is not. There’s nothing like a good bowl of soup and I can always use new recipes. Count me in! I would love to win your soup cookbook. With the rainy weather we have, we always enjoy a good pot of soup. With my husband having CHF, a bowl if soup is something we have missed. I’d love to have your new cookbook. Thanks for the contest! I would love to win. I miss soup so much ever since I was diagnosed with Meniere’s Disease. It’s one thing that I think I miss the most and you have to give up many things to prevent symptoms. I would love to have some soup now because I have a bad sinus infection thanks for your recipes, they are so appreciated for us “low sodium” sufferers. I LOVE soup and could even eat a bowl on the hottest midwest July day! I just recently had to cut sodium in my diet and am looking to try some new recipes! 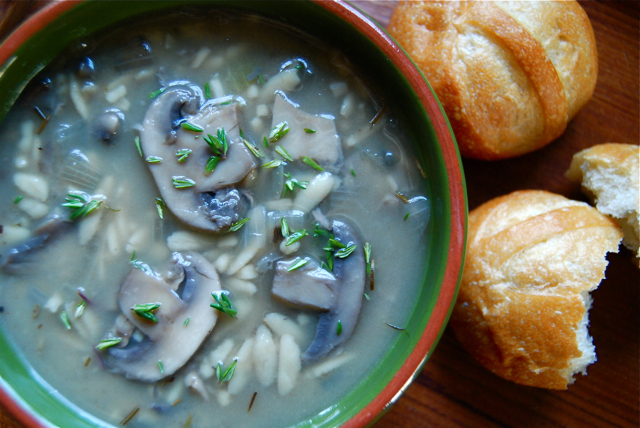 The mushroom and orzo recipe you posted above makes me excited for the other recipes you offer! That soup looks blue! Beautiful. I have to admit that I haven’t made any recipes from your book yet. And that is because I haven’t cooked a single time since I bought it. Hehe? I know your cookbook would definitely help me. I’m still struggling with trying to get a low sodium diet in place after being diagnosed with CHF/Cardiomyopathy last year. Our family is brand new to low sodium living. We need some great recipes, especially for soup! It’s been 1.5 years since i’ve enjoyed some good soup! would love to have some again! This muchroom soup recipe sounds devine! Yes! Yes! I’d love to win your soup recipes!! I have been on a low sodium diet ever since post-partum heart failure two years ago and I’m always looking for good recipes. Soup is one of my favorite things. My husband pre-ordered your newest cookbook for me already and I can’t wait to get it. Anyone would be thrilled to win your book, Dishy – but since I can’t even walk-through a kitchen without setting off a smoke detector I should probably just applaud from the sidelines (as best I can while clutching a fire-extinguisher). Me, Me, ME!!!!! (Raises hand and waves it wildly in the air). I’d love, love, love to win your book. Meanwhile, saving up for your next book! Oooh yum!! I think I’ve told you before, I stink at making soups. I think this cookbook would help! Thanks for hosting the giveaway! I’d love to have your new wonderful cookbook!!!!! Thanks for the contest! Pick me, pick me😁 I am a heart disease survivor and must limit my salt intake. In all seriousness, I would be honored to win. I have so enjoyed and appreciated your blog and emails. Keep up the good work and I thank you for all the time you put into your blog to help folks like me. Happy Day! Yes, please put my name in the hat. I love soups and could use some low sodium recipes. Thank you, Christy! I’ll now be able to make and enjoy real low sodium soups instead of relying on canned soups. Wonderful, Herb! I’m so glad you won and only wish I had copies for everyone. Hope you enjoy it.